Wnen using a text-to-speech system, one of the most crucial moments is that an input text should be orthographically correct. Otherwise, as a result of speech synthesis process, we will obtain incorrect sound text that grates on the ear. “Short U Spell Checker” was designed for checking large Belarusian electronic texts and intended to find and correct one of the most commom mistakes – mistake in writing letters “у” and “ў”. 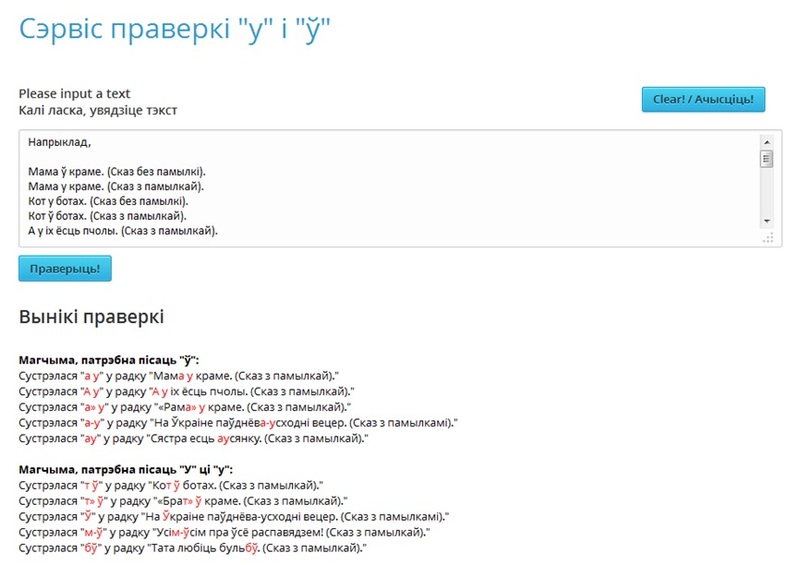 After a normal Belarusian electronic text being inputted, a user can click “Праверыць!” and the service will indicate possible mistakes of two types: firstly, when the letter “у” is placed where the letter “ў” is likely to be; secondly, in the opposite case, when the letter “ў” is placed where the letter “у” is likely to be”. In the process of searching possible mistakes the service not only identifies whether a vowel or a consonant is before “у” but also analyzes characters that do not belong to letters, in case when the letter “у” is at the beginning of the word. These characters can directly influence the spelling of the word. Сurrently the service checks the “у”\”ў” spelling without taking exceptions into account. But is planned to add processing the exceptions into the service.